Titanium is an element valued as much for its beauty as its strength — provided you can find a genuine sample of the stuff. Featured above: The Guggenheim Museum in Bilbao, Spain, clad in titanium and designed by Frank Gehry. By PA, CC BY-SA 4.0. It’s Time To Play The Music: I’m delighted to include in this episode original music by Josh Crowley, a long-time friend of mine who has many talents in addition to composing. Previously, he was my fellow co-author on Seinfelt, a collection of more than 1,000 short stories of surreal horror set in the Seinfeld universe, but he’s since gone on to bigger and better things, including authoring one novel you can buy today, and another in the works. See more of his work at joshcrowley.com. Stronger Than Strong: I needed to specify that titanium has the best strength-to-weight ratio of any metal on the periodic table, rather than any element, because carbon actually blows it out of the water. At least in carbon nanotube form, it’s the strongest, lightest stuff out there. Before their discovery, spider silk held that title. Out, Damn Spot: Our brains are hilariously flawed tools outside of the very specific use of hunting and gathering. That could actually be an entirely separate series in itself, but one example similar to the “weight = importance” issue is called the Lady Macbeth Effect: People with unclean consciences, so to speak, wanted to clean their bodies. We’ve met several elements whose names caused more than a little controversy. Beryllium lost its sweeter moniker, glucium; sodium and potassium were victims of an opinionated translator, leading to incongruous symbols; and we spent most of an episode talking about the great aluminum/aluminium debate. Inoffensive indeed, and even more important, catchy. It’s also pretty appropriate, because, like Iapetus, Ogenus, and Cronus, this element has become widely respected for its incredible strength. Titanium’s reputation is well deserved: It’s reasonably abundant on our planet, and it boasts an incredible resistance to salt water and even strong acids. But Element 22’s real claim to fame is its strength-to-weight ratio, the highest of any metal on the periodic table. For applications that demand a material stronger than aluminum but much lighter than steel, it’s hard to beat titanium. This property has made titanium pretty popular in the usual circles — the aerospace industry and sporting goods, especially — and more recently, it’s become a fairly popular medium for jewelry, especially wedding bands marketed to men. But ironically, the very thing that makes titanium valuable — its lightness — makes it difficult to pitch to consumers as a truly valuable metal. Whether cultural or biological, we humans have a tendency to associate weight with value. This makes a certain kind of sense, as silver and gold are rather heavy and, historically, valuable. But the effect goes well beyond reason. Titanium’s high strength also makes it a difficult and unforgiving material to work with. Titanium lives in the fourth row of the periodic table, but niobium and tantalum, from periods five and six, respectively, are softer and easier to shape — and, conveniently, they happen to weigh a lot more, too. But titanium is completely biologically inert. It doesn’t trigger any kind of immune or allergic response at all. And that makes it an ideal material for things that go on the body… or inside the body. This is another tale of serendipitous discovery, this time starring a Swedish doctor named Per-Ingvar Branemark. In the 1950s, Branemark was really into blood. In particular, he wanted to know more about bone marrow’s role in the production of fresh blood. Being a practical sort of man, he figured he would just take a look. He enlisted some hapless rabbits, carved holes in their femurs, and installed an extremely thin window of titanium. When illuminated with a bright enough light, Branemark could directly observe biology in action. He acquired all the data he needed from this first set of rabbits, and wanted to retrieve the expensive, delicate titanium sheets, so he could reuse them on his next batch of rabbits. This was probably the biggest leap forward in the entire history of prosthetics to date, opening up possibilities for artificial fingers and feet that were bonded directly to living bone; hip and knee replacements that have changed people’s lives; and perhaps most famously, dental implants anchored to titanium screws. Titanium is a versatile metal. It combines with much more than just bone. In 1958, William Buehler was working as a metallurgist at the Naval Ordnance Laboratory, or NOL. He was working on new alloys that could be used for the nosecone of the Polaris missile. Despite its name, the Polaris wasn’t designed to be launched from beneath the ice, so scandium-aluminum was not the alloy of choice, as it was for the Soviets. Buehler earmarked about a dozen alloys to put to the test. and one of them was nickel-titanium. Buehler and his team noticed that this alloy possessed interesting and potentially useful fatigue resistance. So he took a strip of nickel-titanium and folded it into an accordion-like shape, then had it presented at a meeting of laboratory management. They were invited to flex, stretch, and tug at the sample, since this stuff could take it. Associate Technical Director David Muzzey put the alloy to a different kind of test. He pulled out his lighter and applied the flame to the sample. To everyone’s astonishment, the accordion folds disappeared, and the strip stretched out to its original, flat shape. Chemical combinations, particularly alloys, are sometimes given cute names like that by their creators, as we’ll see in future episodes. Other times, it’s merely a coincidence. For instance: If you’re reading a chemistry textbook, you should be aware that TiN is not tin, even though it’s literally the letters t, i, and n. No, the element tin has the chemical symbol Sn, from its ancient Latin name, “stannum.” (Spoilers for episode 50, sorry.) TiN, as you might have guessed, is titanium nitride. It’s an extremely hard material that’s often used to coat tools, or occasionally costume jewelry, since it has a goldish hue. But if there’s one titanium compound that rises above all the rest, it is without a doubt TiO2: Titanium dioxide. This stuff is in everything. The most noteworthy thing about titanium dioxide is its bright white color, which is a trait that’s in higher demand than you might presume. Painter of the people and nap enabler Bob Ross almost always had a dab of “titanium white” on his palette, and that wasn’t just a poetic name. Titanium-based paint is far superior to lead paint, not just because it’s non-toxic, but it’s also a brighter white that’s more opaque than lead paint. Thanks to that high opacity, titanium dioxide winds up in pretty much every color of paint, as the base to which pigments and dyes can be added. TiO2’s ability to block out anything underneath a coat of it is referred to as its “covering power,” and that’s useful for more than just the stuff that goes on a canvas or a wall. Many sunblocks depend heavily on titanium dioxide’s ability to cover your skin, making it opaque to the sun’s harmful UV rays. And it even makes its way into the pages of some books. Literally! I’m not just being punny here — the very pages of some books are infused with titanium dioxide, which not only confers a pleasantly pure white to the page, but prevents the ink from bleeding through to the other side of the paper. And, while I’m sure this is merely a side effect, it does cause a book to weigh considerably more than a frugally printed book. In that case, the better product actually does weigh more, and titanium accounts for that heft. Everything is relative. Titanium almost never entered the picture. The whole time, the plan was to clad the building in steel. But one eagle-eyed developer noticed that titanium had suddenly dropped to a historic low price, thanks to Russia selling off most of its titanium stockpile. Gehry, who had long been fascinated by titanium anyway, jumped on the chance. 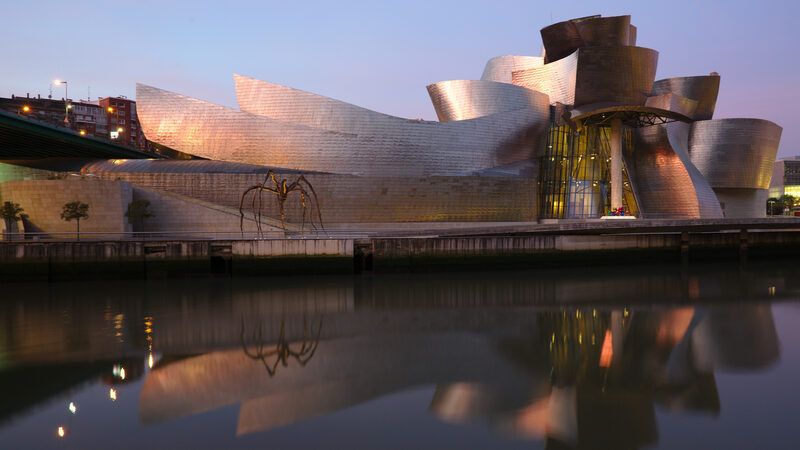 The result had long-lasting effects for Gehry’s career, the city of Bilbao, and how the public perceives architecture as an art. Element collectors looking for a pure sample of titanium should be particularly discerning. Much like fine art, there’s quite a market for counterfeits. High-carbon steel will provide a shower of yellow sparks, while aluminum won’t burn at all. Of course, it’s not always practical to take an object to a grinding wheel, like in the case of jewelry. But there’s still an easy test there, too. Let’s say you’re being sold a titanium ring, and you suspect it might actually be made out of steel. Just ask if it would be easy to get the ring resized. Remember how titanium is extremely strong? If the salesperson assures you that resizing that titanium ring would be “no problem,” then you probably want to take your business elsewhere. Thanks for listening to The Episodic Table of Elements. Music is by Kai Engel. To learn which nonmetal is several orders of magnitude stronger than titanium, visit episodic table dot com slash T i. Next time, we’ll paint with all the colors of vanadium. This is T. R. Appleton, reminding you to wear sunscreen. Discover, Holding Heavy Objects Makes Us See Things As More Important. Ed Yong, August 25, 2009. Gizmodo, Are Beats Headphones Really Designed To Trick You? Mario Aguilar, July 10, 2015. Dermnet NZ, Jewelry Allergy. Vanessa Ngan, 2012. Journal Of Periodontal Implant Science, A Tribute To Dr. Per-Ingvar Branemark. Tae-Il Kim, December 31, 2014. The New York Times, Per-Ingvar Branemark, Dental Innovator, Dies At 85. Tamar Lewin, December 27, 2014. The Chemical Educator, The Story Of Nitinol: The Serendipitous Discovery Of The Memory Metal And Its Applications. George B. Kauffman, Isaac Mayo, June 1997. The Los Angeles Times, Two Decades After Gehry’s Guggenheim Bilbao, Where Does Architecture Stand? Christopher Hawthorne, October 12, 2017. Arch Daily, The Unexpected Low-Tech Solutions That Made The Guggenheim Bilbao Possible. Ashley Mendelsohn, October 18, 2017. Popular Science, Titanium Or Plain Ol’ Steel? Theodore Gray, December 19, 2007.